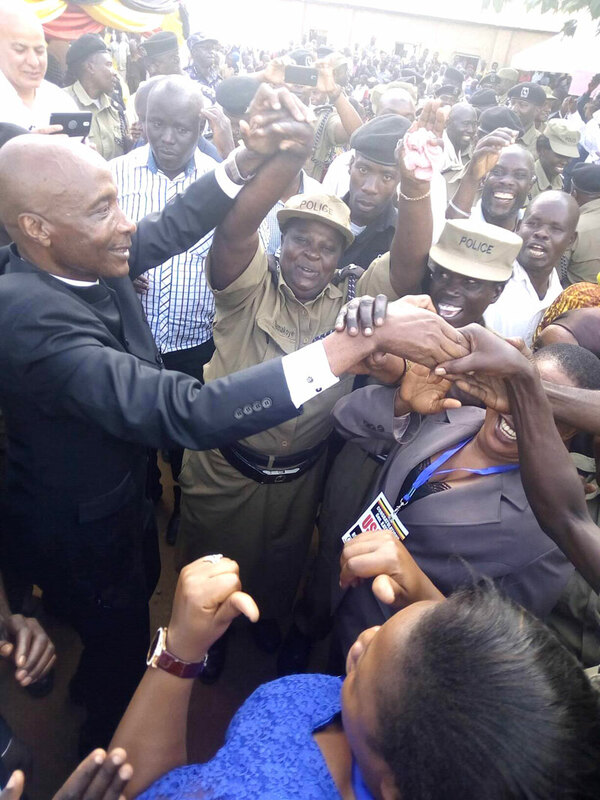 Gen Kayihura celebrates his re-appointment with Mbale residents on Sunday// Denis Oduut. MBALE. The Inspector General of Police Gen Kale Kayihura has said building trust between Police and citizens tops agenda in his new term. The police chief, who was speaking during his thanksgiving party at Nauyo Primary School, Bukasakya SubCounty in Mbale District on Sunday, scoffed at his critics, saying only his appointing authority (President Museveni) knows him thoroughly. “Museveni knows all my weaknesses and he knows what I can do. People talk a lot but none of them really know me,” Kayihura said. Gen Kayihura, whose fifth three-year term as IGP was approved by the Parliamentary Appointments Committee a fortnight ago, also said he will continue with the commitment of building the capacity of officers to fight terrorism, as well as the two most common vices that have in recent times befuddled the face of the Uganda Police Force he leads: murder and robbery. “I’m pledging to you and the whole country that in my new term, we are going to rectify the all weaknesses and to audit all officers to address the issue of Kitu Kidogo (bribery),” Kayihura said. The IGP’s comments come at a time when Police faces widespread criticism over increasing insecurity and the application of torture in its investigations. The latest case stems from gory images of the Kamwenge town council chairperson Godfrey Byamukama, who was reportedly tortured at the now controversial Nalufenya Police Station at the source of the Nile in Jinja District over suspicion of taking part in the killing of former Police spokesperson Felix Kaweesi. Several other suspects charged in the recent assassination of Kaweesi complained in court of being tortured while in detention. However, in a rather baffling twist, the IGP said Police will also beef up the fight against terrorism and construct a monument at Nauyo to commemorate acts of state-orchestrated terrorism once facilitated by President Idi Amin’s regime. The monument will be erected near the home of the late Jack Maumbe Mukhwana, one of the eminent figures of the National Resistance Movement (NRM). Gen Kayihura visits Mbale Police Station on Sunday// Denis Oduut. On January 22, 1973, Yoweri Museveni (then a freedom fighter and now president) narrowly escaped being killed by Amin’s forces at Maumbe’s home in Malukhu Estates in Mbale town, an act Kayihura on Sunday described as ‘state terrorism’ committed by Amin soldiers. “This is one of the first tasks of my new kisanja (term of office). This monument will help document history and will give strength to children to love our country,” the IGP said. Commenting on the recent torture claims, Kayihura said: “In the management of cases, we are going to rectify all weaknesses in criminal investigations and audit the quality of police officers in crime intelligence. “Those who will remain, we will train them thoroughly to perfect their work,” Kayihura said amid cheers from the crowd that seemed to warm up to him. Kayihura also noted that Police will hold timely refresher trainings to address the issue of errant officers that are increasingly denting the image of the Force. Kayihura, whose new tenure will run until 2020, also took time off his 40 minute speech to rebuke his critics, arguing that none of them knows his weaknesses and strengths than his appointing authority — President Museveni. “There is nobody who knows me better than the president. There are people who talk about me but they do not even know me, there is only one man who knows me thoroughly and that is the president; he knows my weaknesses and also knows what I can do,” Kayihura said.